Hawaizaada makes an astonishing claim, one that the makers of the movie admit they cannot prove. It says that eight years prior to the hullabaloo that surrounded the achievement of the Wright Brothers, there was an airplane that took off from a Mumbai beach - in 1895. This was the accomplishment of a very intelligent man, Shivkar Bapuji Talpade, says the film, and it has not been acknowledged by the world in general. Which is why this is such an important movie in Indian history, although it is a movie filled with inaccuracies and an appalling lack of structured content. Shivkar, or Shivi (Ayushmann Khurana), is, towards the end of the 19th century, a good-for-nothing son of an affluent zamindar. The Talpade family resides in Mumbai, and Shivi, who has not completed his education - he has flunked the same grade enough number of times for his very young nephew Narayan, or Naru (Naman Jain), to catch up with him as his classmate. One night, a drunk Shivi, who plays the trumpet in a club, finds himself in the premises of a drama company, having mistaken it for his house. This is where he meets with Sitara (Pallavi Sharda), a tamasha dancer. He falls in love instantly, and frequents the joint thereafter, much to the disgust of his father and brother. The constant bickering between father and son leads to Shivi walking out of the house one day. A rather eccentric scientist, Shastri (Mithun Chakraborty), who sees potential in Shivi, takes him in as his assistant. Shastri lives in an abandoned wooden ship, and this is where he has been trying, unsuccessfully, to achieve a rather difficult dream - the construction of a vehicle that will allow men to fly with the birds. With Shivi's help, and after many experiments, Shastri thinks he may finally be able to achieve the impossible. However, a few issues need sorting out - Sitara disappears from Shivi's life, the British want their hands on Shastri's notes (and are willing to pay for it), the project needs a generous financier to build a machine, and Shivi has to find a purpose to his existence - before a man can man a flying vehicle. A descendant of Talpade, along with three Vedic research scholars, had asked for a stay on the release of the film. Their complaint? That the personal details of Talpade's life - drinking, consorting with a dancer, dropping out of school, etc. - are falsely portrayed. The movie has released, but the story remains the same. What should have been an exciting, dramatic, fictional depiction of this extraordinary man becomes a montage of silly, disconnected sequences with absolutely no attempt at a structured narrative. It goes from inane romance to intense pining, from biographical to fictitious, and from indifference to patriotism, in no particular order. While it is possible to have a movie of mixed genres, every emotion, action and reaction is so random that you may begin to think that you are watching several short films one after another, with the same actors. The dialogues are archaic, to say the least. It does not help that you have no clue to what is going on in the movie. The protagonist goes around asking, every now and then, if he will ever fly, and that becomes tiresome. Also, the liberal smattering of Marathi dialogues, without subtitles, are odd, arbit, and seem rather forced. The frivolous humour does nothing to add to the film. In fact, this entire movie is a rather shoddy and flippant biopic - a genre that Indian films just do not seem to get right. Also, for a movie that is about an intelligent mind that possesses an understanding of science, there is hardly any sequence that shows or explains the utilisation of the same knowledge to build a flying machine. The characters just pore over notes and make models of airplanes, with a noticeable lack of discussions and debates in the dialogues. What exactly the British have against these Indian pioneers is a mystery. The Viceroy does not mention that the Western world should not think that the illiterate Indians have any intelligence, but why they run after the scientists remains a secret. Important characters, such as the royal couple who funds the project, and the important-looking freedom fighter, are not referred to by name, and you have to guess who they are (the Gaekwads of Baroda and the nationalist Mahadev Govind Ranade, in case you are curious). Other characters have no intensity and are not justified in the actions that they carry out in the film. The end of the movie, after a series of repetitive and predictable sequences, is ambiguous, and a romanticised version of events. The actors do not contribute much to Hawaizaada. Ayushmann Khurana pouts and grimaces with an open mouth, when he is not pursing his lips. He has his head in a perpetual tilt, and his eyes look funny. He does not even try too hard to be Talpade, but instead emulates Ranbir Kapoor in Barfi, and that body language is not relevant to this character. Mithun Chakraborty does his bit with conviction. The actor playing Shivi's sister-in-law is rather conscious of her role. Pallavi Sharda is nothing more than a prop, and also very awkward. The person playing the British officer is a mediocre actor. The only one to stand out with his performance is Naman Jain - he is convincing, and a natural talent. Vibhu Virender Puri used to be Sanjay Leela Bhansali's assistant, and the influence shows. The entire palette is a tribute to his ex-boss, but that is it. None of the visuals is reminiscent of the art that the senior director's frames exhibit. The colours are warm, but the movie looks best when it is shot in live locations. The studio-like setting in what is supposed to be a true story lacks authenticity - the architecture and the interiors, for example, lack uniformity. The lighting could have maybe made the frames better, but even the cinematography is mediocre, at best. Special mention must be made of the ship and its surroundings - it all looks rather artificial, especially because of the design and lighting. Since these sets and visuals are interspersed with visuals of natural settings, the overall impact is jarring. The airplanes, however, look interesting. The costumes are quite absurd - middle-class Indian women in the 1890s definitely did not wear European clothes with such detachment. The costumes are ill-fitting, and look very out of place. You may notice that the Maharashtrian sarees that the women wear in the background every now and then are all alike. The biggest irritant is the number of songs - they pop out at short intervals and seem unrelated to the goings-on in the story. And there are just too many of them, and not a single one is memorable. The editing is haphazard, to put it bluntly. 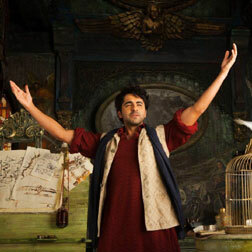 Hawaizaada is an important movie, as we mentioned above, but it fails to live up to expectations. Shivkar Bapuji Talpade deserved a far superior retelling of his life. The trailer of the movie, on YouTube, is more structured than the movie itself, and we suggest you watch the former instead of the latter. Be the first to comment on Hawaizaada! Just use the simple form below. fullhyd.com has 700,000+ monthly visits. Tell Hyderabad what you feel about Hawaizaada!